Jungle Red Writers: All I Want for Christmas is what??? RHYS BOWEN: Are you all in the holiday spirit? I would be if I could get the bleeping lights on the Christmas tree to work. I've ordered most of my gifts online which avoids going out in the rain. And if you're anything like me, you've received several gazillion catalogs. Some of them are fun and useful but this year I got one of those MOST OUTRAGEOUS AND USELESS GIFTS EVER type of catalog. So here is my top ten list, starting with the most harmless. 1.The spinning spaghetti fork. It has a thumb-activated button that sets the fork rotating to wind up your spaghetti. At only $20. A bargain if you can't twist a fork by yourself. 2. 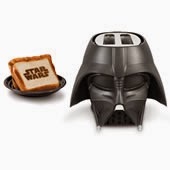 The Darth Vader Toaster: toast your bread in this likeness of the iconic villain. Would you want Darth Vader staring at you, early in the morning, on your kitchen counter? Who could possibly want Darth Vader on their kitchen counter, unless you are George Lucas or have a Star Wars themed house? 4.And if gets even colder: The Subzero Warm Breath Mask. Preferred by high altitude mountaineers (in case you have any of those on your gift list). It humidifies and warms winter air for more comfortable breathing. Maybe our Red who lives in Maine might think it's wonderful. 5. Light-casting gloves. An LED light in your gloves can shine on the front door as you try to insert your key without taking your gloves off. And the fingers are tipped with a material that mimics human skin so that you can use touch screens without taking gloves off. May be useful to see what you are eating if you go through the drive-through in your car. 7. Here is my favorite (NOT) a realistic remote controlled tarantula! Anyone who bought one of those for me for Christmas would definitely be on the "naughty" list forever. 8.And for those who like to go big: a 15 foot inflatable Rudolph. In the picture it looks like the reindeer could squash the house if it sat on it. And it's only four hundred dollars. I must get two. 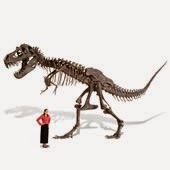 9.And speaking of big things: A LIFE-SIZE TYRANNOSAURUS SKELETON. And I mean life-size. I don't know about you but a forty foot long and fifteen foot high Rex would not fit in my house. (Maybe it could go on the lawn and devour Rudolph). And it's a mere HUNDRED THOUSAND DOLLARS! 10: And last but not least: The Celebrity Robotic Avatar. This robot is adult-sized, has appeared in movies, and is controlled by a wireless remote, small enough to escape detection so that it looks as if the robot is reacting by itself. It can engage in impromptu banter with guests. It's LED mouth lights up when it talks. Shipping weight is 500 pounds and it costs a mere $345,000. For that amount I could hire a first-class butler whose mouth didn't light up when he talked but could move without a remote! So Reds:Would you want to put any of these on your Christmas list? Have you found anything more outlandish than these? Do share. No Darth Vader toaster for me; no Rudolph or T-Rex in my front yard. Most outrageous things I've seen for children this year: a doll that swears, a pretend tattoo parlor, and a war zone doll house. Seems like there's a lot of people out there who need a refresher course in the meaning of Christmas . . . .
Oh, Rhys… ha ha. So sorry. Nothing very outlandish. Steve and I just decided we are each doing one holiday thing, and having one favorite holiday food. Doesn't sound outlandish is it? No, I guess not. But for us it is. My thing is to call Auntie-Mom. I don't know what my special food choice will be, but I'm almost certain it will not be Darth Vader toast. Steve is ordering a movie for his thing, and I have already decided to cheat a little by adding just one extra thing by making another attempt at sending cards. Last year was so awful for us I didn't do it. This year is worse, which proves nothing except it didn't help anything to do nothing except to maybe make us feel even worse. So! If we send cards and—don't tell Steve, because he doesn't know it yet, but he will also be cheating by adding just one extra thing in writing one of those newsy letter inserts. For us this is very outlandish. Okay, not what you were looking for in outlandish? Let's see. My sister-in-law, Judith, once gave one of our teenage sons (who was at that time in the midst of a rock music brain melt) L. Ron Hubbard's Scientology recruiting tool of the 80s—Space Jazz album. I think he threw it on a New Year's bonfire in Denmark. Rhys, a heartwarming story I saw on the news last night: a little boy with a serious medical problem needed special food delivered often. He became close friends with the UPS driver and decided he wanted to be just like his friend. UPS had a mini-UPS truck made and delivered it to him, along with a uniform, so he could deliver cookies to his neighbors! You made me laugh first thing this morning - a good thing! But you also made me go "ewwwwww." Some of those things are just awful, aren't they? I'm working on my upcoming Reds post as we speak, and it's about Christmas traditions at our house. These catalog folks would find us to be pretty boring, truth be told. Gosh how did I live without a Darth Vader toaster? Seriously. It's also the perfect gift for my son in law. Actually, what I don't want for Christmas is ANOTHER GADGET. Period. Nothing more, thank you very much. Cookies, caramels, fudge... bring 'em on! Homemade, svp. OK, I think the Kiddo and Hubby would LOVE the T-Rex -- however, we have no room. Oh well. We get a heck of a lot of catalogs in the mail, and I flip through 'em from time to time, but pretty much try to buy from local merchants. That said, my family does what is known as a Yankee swap the week before Christmas. There is (unspoken) competition to contribute the silliest present to the pile. A potato peeling gizmo called the Rotato gets passed around annually. I'm sure no one has ever used it. This year I'm tempted to buy and wrap up a pair of those slippers with headlights to guide one to the bathroom in the middle of the night. A remote control taratula? Uh, no thanks. And I don't even think Rudolph - or that T-rex - would fit in my yard, never mine my house. Our Christmas traditions are pretty tame and mostly involve food - including four or five varieties of cookies. We're downsizing our tree this year (besides, the one I have is almost 20 years old). For gifts, our family decided several years ago that we didn't need more stuff and started doing donations to favorite charities. Although my daughter does want some sort of USB-connected pad for her Mac that lets her draw on the pad and transfers it to computer. The Girl wants to be in charge of decorating this year. Have at it, kid. The kids are finally old enough that we can stay up until midnight and watch movies. And eat cookies and egg-nog. And yes, we will still probably watch the Santa-tracker (even though we're way beyond Santa). I'd love that toaster! Do they have any other ones? Would be fun to have one that toasts up clues, right? Ha, that Rudolph in the photo looks as though he ate the T-Rex. That thing is at least 30 feet tall. Hallie, I'm with you on the no-gadget policy. One of my sisters-in-law (no longer in the family, yay) always gave me the dumbest gifts: a banana sling (to hold your bananas while they ripen), a set of those multi-colored cordials on a tiny tray. She really wanted it for herself, and I wish she'd kept it. The tiny little glasses fit nowhere, and were always threatening to tip, especially when on the tray. Haven't seen much this year, partly because I refuse to watch TV any more, and have gotten Catalog Choice to stop most of the catalogs coming to the house. And since I have not read the gift catalogs that are always in the airplane seats. FChurch, what a great story! The absurd (yet awesome) gift I saw yesterday that I'm still considering buying is the bacon bowl. Yes, reheatable, edible bowls made of bacon. Just fill and eat! Two for one packages, available at the "as seen on TV" store. If that's not an endorsement, I'm not sure what is! My son-in-law would probably love the Darth Vader toaster too, in fact both of them would. My daughters? not so much. I know a young woman (20's) who was given a similar Hello Kitty toaster and LOVED it. My favorite website for unusual stuff is thinkgeek.com. One of my favorites is the Star Wars Tauntaun sleeping bag. (think about how Han saved Luke on the ice planet and you get the picture). I mean, really, I could spend hours there looking at all the lovely weirdness. The thing I can't understand: who would spend hundreds of thousands of dollars on a Christmas gift? Even if I had that sort of money I'd never waste it on ridiculous stuff. Making a mental note to buy Rhys the tarantula. I so appreciate you giving us your wish list like this. Rhys, Nieman Marcus used to have ONE over-the-top gift every year that cost hundreds of thousands of dollars. (I opened a NM account just so they'd send me the catalog, although I closed it years ago.) One year, I think the gift was his-and-hers helicopters. I had to keep reminding myself that the HQ of NM is, after all, in Texas, which prided itself in this kind of thing. I'm not on that catalog list, Rhys, and I don't want to be! PK, I love thinkgeek and I don't think I've seen it this year. Rhys, obviously I am not getting the right catalogs. I've only had the ones with silly sweatshirts and mugs that have writing appear when you pour in hot liquid. Boo. We don't usually do big presents at our house, although Rick did give me an Android tablet Christmas before last, which I am still loving. And I try to stay away from gadgets, and THINGS. Unless it's something I know someone wants--daughter is getting some gorgeous champagne flutes from Anthropologie. Otherwise I try to go with consumables. Food, books (yes, they are consumable:-)), etc. I'm giving the pair with the sweet girl and her horse that say "I hate everyone too" (or something like that, can't remember exactly) to a friend who calls herself a misanthrope. Socks! Great gift. Who can't use another pair of socks? And my favorite: some nice soap. I love fancy soap. Hubby's latest toy is a 3-D printer, so I could give him the 3-D pen to go with it. Keeps him entertained. I do keep giving him books, too. I'd like the tarantula. Rhys, wow! Although I receive many catalogs in the mail, I do not think I have seen any of these you listed in the catalogs. Or perhaps I did not notice. Ordering online makes life easier if you know the company well. Rhys, I missed that catalog, too, and I haven't looked much at catalogs this year. It could have something to do with the fact that I have completely lost my mind, having my living room and adjoining office area redone--painting and flooring--starting next week. My foyer, dining room, family room, and hallway to the bedrooms are full of extra furniture and the contents of my antique corner cupboard. Oh, and one of the bedrooms has the bed covered, too. Sorry, I know I just rambled on about that, but people with no mind left tend to do that. Hahaha! I actually think that my adult son would like the Darth Vadar toaster. He and I enjoy quirky gifts, and this year I'm giving him a woodburning of Snape from Harry Potter. A sweet girl that I met at last year's Bouchercon does beautiful work in wood burning, and I've commissioned her to make one for him. My son will love it. However, my daughter is very practical and shopping for her requires sticking to useful items. Books are always a must on my gift giving list to the immediate family. My son and daughter are sending me their picks today, so that I can choose what to get them in that department. I've already ordered my books for me and for the younger granddaughter. The older one is probably getting a new book called Dreamwalker. I usually get my husband a non-fiction book dealing with military history. FChurch, that was such a sweet story about the little boy and the UPS gift. Joan, a doll that swears? Yikes! Mark, you made me laugh telling Rhys that she had posted her wish list. PK and Debs, I'm a fan of thinkgeek, too. Lisa, I love crazy socks and giving them as gifts. There was a Web site that someone (was it on here?) recommended for fun socks, but I can't remember what it was now. Any idea or where do you get your socks? ... not that I wouldn't love a Darth Vader toaster! If I were still on the job I would buy one for each resident advisor's kitchen at the med school dorm.They would love them! They come with a light sword and leave with a caduceus. My div student supervisees would get them too, but they've recently lost their dorms to make room for, I don't know, books and things, and have to live at the law school and other fun places. Two things are regularly destroyed in med school—toasters and fire sprinklers. Students, residents, visiting fellows, and researchers hang their clothes on fire sprinklers. As quoted from email by a visiting fellow in neurology, "I didn't know those were the sprinklers you mentioned in the handbook. I thought you were talking about lawn sprinklers. And I thought, well this must be old. There's no grass here. Just a tennis court. So you see that's why you should allow me to continue living here and not send the bill to my country." Seriously. He said that. Then he wanted to know if he could reopen the woodshop over the holidays there would be nothing to do, and he was "... quite sure surgeons would never put their fingers near the blade if they were allowed to operate the table saw without that safety shield thing whatever." What I said, "NO!" Brenda, you may be a long lost cousin of mine! We do the Yankee Swap, too. Some relatives contribute very lovely inexpensive items and some contribute weirder stuff. A very popular item one year was one of those plastic ponchos that folds up into a very tiny package. It wasn't the poncho itself everyone coveted; it was the set of instructions for using it, which was hysterical! (I'm not sure but I think one use was to "cover a body" with it! Anyone who gave me a tarantula would be on MY permanent "naughty" list! I once bought a huge papier mâché pig bank at the Mexican border. I named her Princess Daisy and wrote a backstory that included her jumping into a volcano to save her lover. As she leapt to her death she put a curse on anyone who disposed of her porcine likeness. Well, of course she came back to me with a continuation of the story that was a lame excuse for not keeping her. She was passed around with everyone adding to her history until she mysteriously disappeared during a garage clearout.